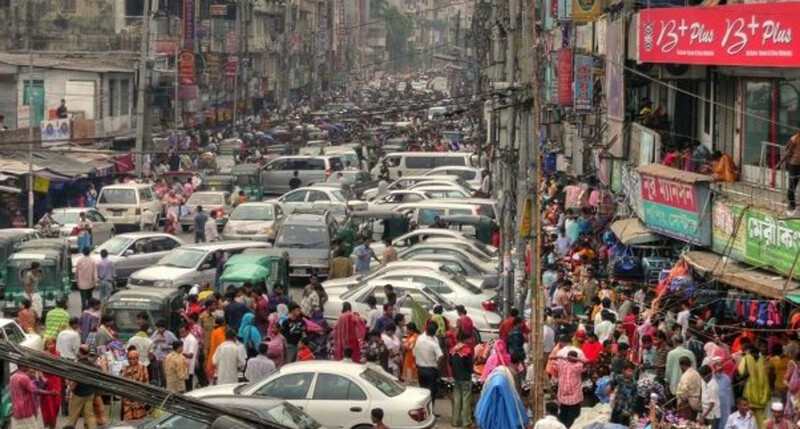 Traffic congestion is a chronic problem in large cities across the world. Millions of urban commuters experience slow but aggressive traffic, noise and pollution fumes, on a daily basis. Reflecting this concern, various urban traffic policies focus on reducing peak-hour congestion, either through pricing or quantity restrictions. Such policies are often controversial (Hanna et al. 2017) and their welfare impact difficult to quantify. Economists have long proposed charging road users fees that scale in proportion to the amount of congestion. The idea is backed by common sense and economic theory. Drivers impose ‘externalities’, namely, a cost on society, notably by slowing down traffic. Typically, drivers do not take this into account, which leads to excessive congestion. Hence, it is presumed that judiciously chosen pricing can significantly improve traffic and commuter welfare. I organised an experimental pilot of peak-hour congestion pricing policies (to measure how commuters respond to pricing). I measure the road traffic externality, that is how additional vehicles slow down traffic. I compute (city-wide) optimal charges and their travel time benefits and schedule disruption costs. In the study I focus on within-day commuting changes, and I do not quantify benefits from reduced exposure to pollution, nor longer term responses to pricing such as switching to public transport. 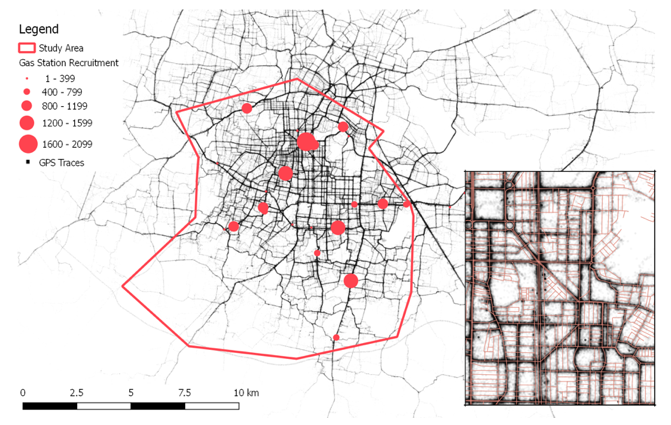 The backbone of the study are fine-grained commuting data from a sample of Bangalore commuters. Specifically, surveyors stationed in gas stations in South Bangalore approached car and motorcycle commuters and invited them to participate in the study by installing a smartphone app that collects commuting data, including departure times and routes. (More than a quarter of eligible drivers agreed to participate.) The resulting dataset covers over 100,000 individual weekday trips and almost one million kilometres of travel. The data confirm that Bangalore is one of the most congested cities in the world: commuters spend an average of 1.5 hours driving each weekday, with an average speed of only 14 km/h.I later use the same data to implement pricing policies. In a real-world policy, charges may be based on data from GPS responders installed in vehicles (Martin and Thornton 2017). The ‘departure time’ policy: Trips were charged a pay-per-km rate that depends on the trip start time. This meant being charged zero for off-peak departures, and higher for departures close to peak-hour. The ‘area’ policy: Commuters were charged a flat fee for driving through a small area along their usual route, giving them the option to drive along a longer but untolled alternate route. Participants faced real monetary incentives to change their how they travel. In practice, charges were calculated automatically and subtracted from a prepaid virtual account that was set up for each participant. Each week during the experiment, the outstanding balance was transferred to the participant’s bank account. In response to the ‘departure time’ policy, commuters demonstrated moderate flexibility in moving their trips away from their typical working hours in order to save money. They left earlier by around four to six minutes on average in the morning, and later in the evening. In response to the ‘area’ policy, participants crossed the congestion area less frequently by switching to longer routes. Commuters value the time spent driving highly. Commuters have moderate schedule flexibility. 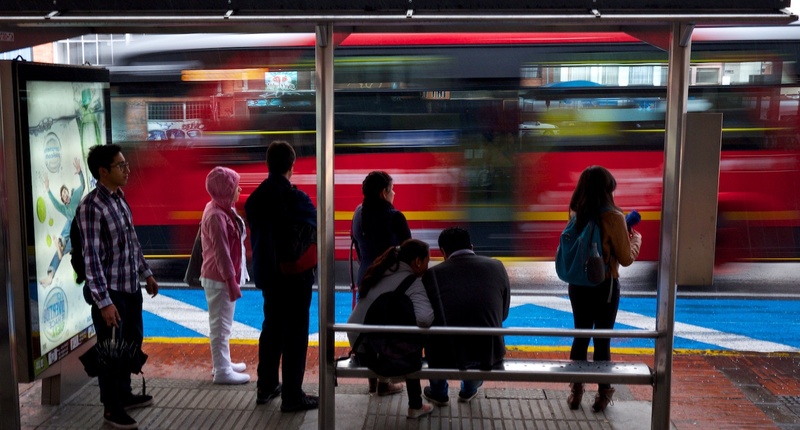 For example, a typical commuter is roughly indifferent to leave one hour earlier than usual in the morning, as long as this results in 15 minutes faster travel time. By themselves, the experimental results are moderately encouraging that congestion pricing could have an important beneficial impact on travel times and commuter welfare. However, to fully understand these consequences we also need to know how road speeds are determined. Optimal congestion pricing depends crucially on the cost that drivers impose on society. 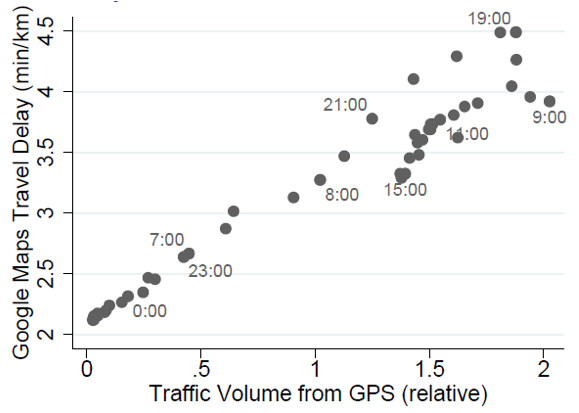 Here, I focus on the decrease in road speeds, using the large data set of GPS traces collected in the study and typical variation within the day. (I do not study costs related to pollution, which may also be important.) I find that each additional vehicle on the road has a roughly constant effect to increase average travel times (Figure 3). Quantitatively, making a half-hour trip during peak-hour leads to an increase inthe aggregatedriving time of everyone else of around 17 minutes. This social cost is important, yet significantly smaller than indicated by previous engineering research in the US, especially during peak-hours. Interestingly, Akbar and Duranton (2017) document a similar relationship in Bogotá, Colombia. 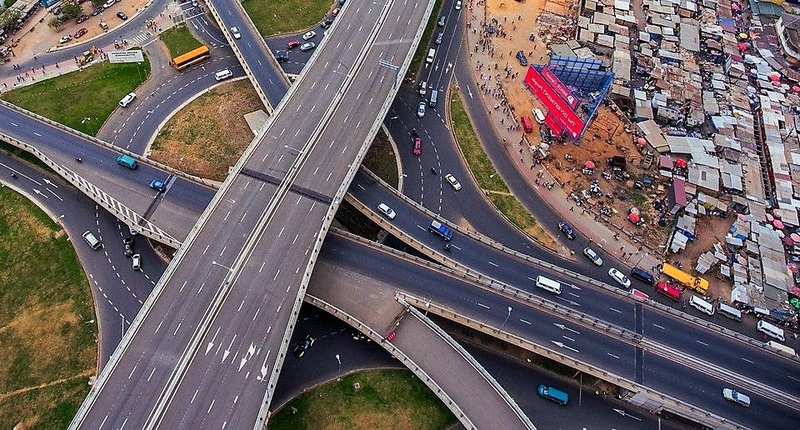 This suggests that the road technology in developing cities may be fundamentally different from highways in rich countries, a topic that requires further study. In the last step of the study, I put the first two parts together to simulate how a city-wide congestion pricing policy would play out. To make progress, I make several simplifying assumptions: in response to pricing, commuters in the model do not change home and work locations, nor their likelihood of using public transport or cancelling trips. Peak-hour congestion pricing chosen optimally only delivers small benefits of 2-6% faster traffic. Furthermore, when also taking into account the schedule costs of commuters who avoid charges, the net gains are almost negligible at 0.5% of the total trip cost (only 5 rupees, or 8 US cents, per commuter). What drives these surprising results? Intuitively, the social value of the travel time saved by removing commuters from the peak-hour is not significantly larger than the costs to commuters of traveling at different, inconvenient times. In turn, this is mostly due to the small magnitude of the road speed externality. The mere existence of severe traffic congestion does not, by itself, imply that the gains from congestion pricing would be substantial. Indeed, peak-hour pricing in Bangalore would only have a small benefit in terms of traffic speeds. It is of course possible that congestion pricing would still yield large welfare benefits in other cities, and in future research it is important to also measure how drivers switch to public transport and carpooling, and how home and work decisions depend on travel and monetary costs. In addition, pollution exposure due to traffic slow-downs, as well as motor vehicle accidents, also encompass externalities. Even so, this study shows that arguments in favour of congestion pricing require careful measurement and understanding of driver responses and the determinants of road traffic congestion. 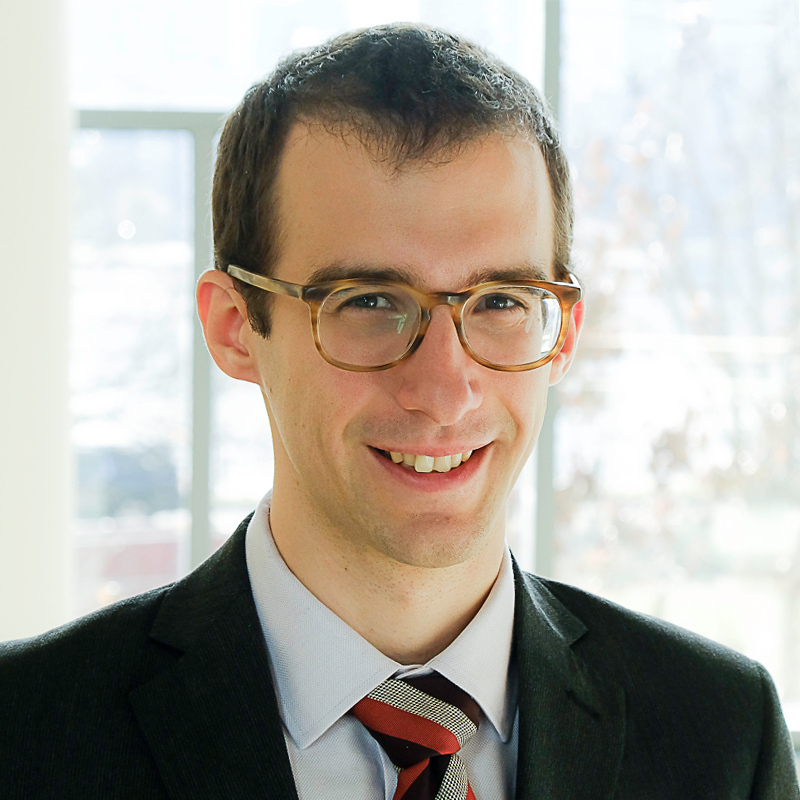 Editor’s note: A version of this column was previously published by the IGC. 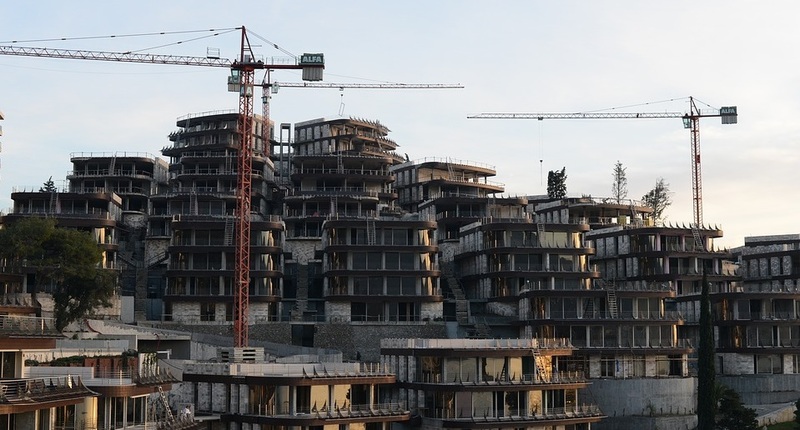 Akbar, P and Duranton, G (2017), "Measuring the cost of congestion in highly congested city: Bogotá", CAF Development Bank of Latin America, Working Paper 2017/04. 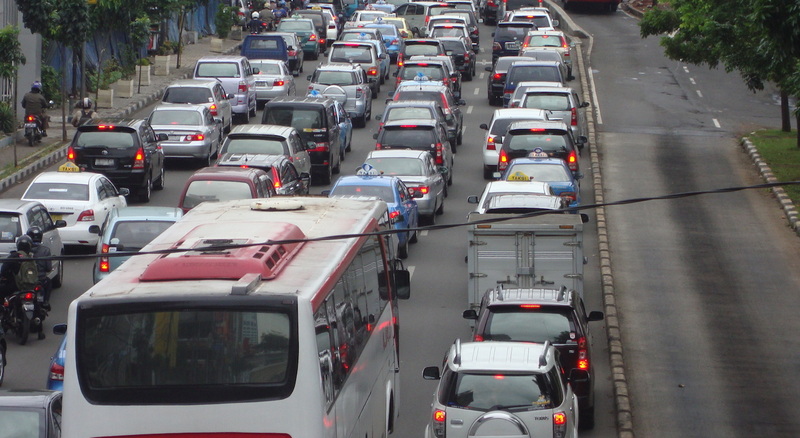 Hanna, R, G Kreindler, and B A Olken (2017), “Citywide effects of high-occupancy vehicle restrictions: Evidence from “three-in-one” in Jakarta”, Science 357(6346): 89–93. Martin, L and Thornton, S (2017), "Can road charges alleviate congestion? ", Working Paper, SSRN.